It’s no wonder you are Cape Cod’s favorite shrub. Your flowers are huge, abundant and long lasting. And those colors! I don’t know which phase I like best: the time when flowers first open and are partially white, when your blooms are that improbable shade of blue in the summer, or when they turn purple and green in September. You really know how to put on a show. It’s no wonder that these sad brown remains bother so many people. It’s hard to see something wonderful come to an end. I join others in wishing that you were an evergreen with flowers so hardy that they last through the winter. If you don’t live in a Disney cartoon it’s not possible to grow fantasy plants, however. 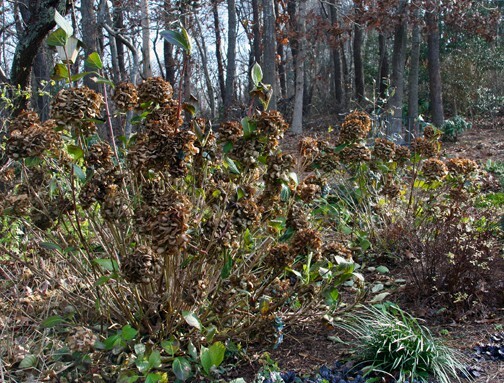 Thanks, Brown Hydrangeas, for reminding me not to be greedy. After three heavy frosts there is one flower with just an edge of blue left...reminder to self: be grateful for these reminders but also for the entire plant as it is.